When you think about beaches, Florida naturally comes to mind. What many people don't know is that most of the beaches in Florida are heavily maintained to prevent erosion and are in many cases are totally man made. The same is true for the many small islands that Florida is famous for. One of them stand out for not being man made or heavily maintained, that's Caladesi Island on the gulf coast near Clearwater Florida. 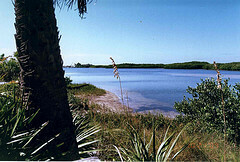 The island is designated a state park and is only accessible by boat. You have the option of piloting your own to the island or riding the hourly ferry that operates back and forth to the island. Like many on the gulf side, Caladesi island offers small waves and lots of good shelling opportunities to visitors. Since Caladesi Island is fairly large, people can spread out and not feel crowded. The middle area of the island is filled with narrow canals and mangroves that are home to several species of plants, birds, reptiles and fish. Visitors can explore these canals by renting kayaks at the park store. Another favorite pastime is cooking out at the beach. The park offers plenty of grills, but you must bring your own charcoal and lighter fluid as they are not available on the island and burning the plant life on the island is prohibited. Although the park has no campsites, guests can stay on board their boats at the island and can even hook up to water and electricity for a small fee. To cover the costs of operating the store, and maintaining the island there is a small daily use fee to guests who are visiting. For up to the minute conditions on the island and to get more information or make reservations for a boat slip or picnic shelter visit the state park website. The site also has directions on how to navigate to the island and to the ferry stop. Last updated by Jodi J on 14 March, 2010 in Destinations.